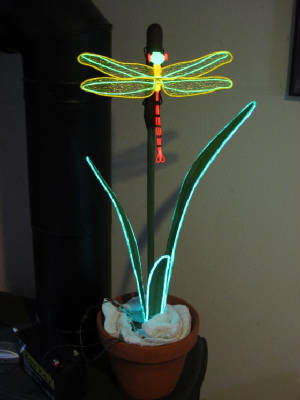 I have been making staffs (EL-Sticks) and other art from electroluminescent (EL) wire since 2007. I believe that I sell a unique product at a reasonable price and have an excellent warranty on my products. To have fun making these staffs. To provide information and support regarding electroluminescent (EL) wire and other EL products. My business was founded in 2007, when I made my first EL staff for Reggae on the River. 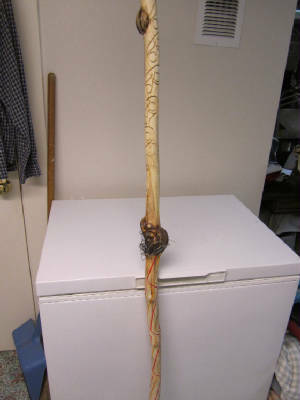 I received many favorable comments on it and thought that others may be interested as well, so I started fashioning additional staffs. I've made almost two dozen of these and now make 2-3 per month. I also do some additional art work such as the EL dragonfly pictured on this page.